This fortnight, Art Intaglio features the work of Paresh Maity, who is often inspired to paint while traveling the world. Maity?s Odyssey series depicts scenes similar to that of his native Tamluk in West Bengal ? of boats languidly floating down Tamluk?s Rupnarayan River. But Maity?s Odyssey paintings couldn?t be further from West Bengal. Rather, these paintings are set in Venice, Italy and along the banks of the Yellow River in China. The artists? use of watercolor evokes the feeling of lazy vacations and time slowed, as Maity observes his subjects in the shifting light from dawn to dusk. In The Day Begins, gondoliers steer with their ores in the morning fog of Venice in front of Saint Mark?s Basilica. After the Rain depicts a calm silence of empty gondolas with their brightly colored images lightly rippling on the water?s surface. InTwilight, the last vestiges of yellow afternoon glow are consumed by the somber shadows of a melancholy Venetian dusk. The mood is similar in the paintings set in China. Spring depicts morning sunrise, solitary canoe and a branch of cherry blossoms, all marked with the red glow of a sultry morning. In Cherry Blossoms, the flowers play a larger role, contrasting to the mist that envelops fishing canoes in the distance. In Journey, Maity likens his own travels with that of the canoes tirelessly curving around the bend of the Yellow River in the midst of an afternoon glow. Paresh Maity was born in 1965 in West Bengal. He is alumni of the Government College of Arts and Crafts, Kolkata and Delhi College of Art. The Delhi based artist has been awarded by Royal Watercolour Society, London, Birla Academy of Art and Culture, Kolkata, Harmony Award, Mumbai among others. We hope these paintings will inspire you just as the artist was inspired to paint during his own odysseys around the world. Art Intaglio is India?s first web superstore for Indian art, dedicated exclusively to art prints and multiples of modern and contemporary Indian artists. We offer a wide range of Original Graphic Prints, Reproductions and Fine Art Prints for you to buy online. Most of these are Limited Edition Prints, numbered and hand signed by the artists. 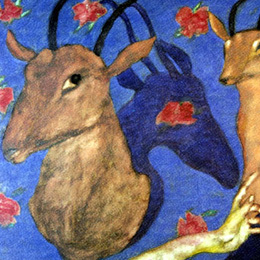 A portfolio of 23 significant works by one of India''''s topmost artists Jehangir Sabavala is available at Art Intaglio. 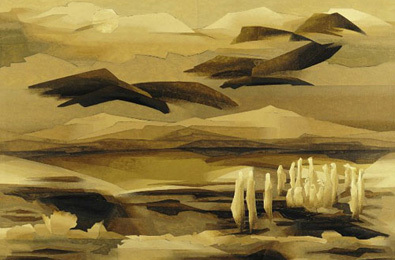 Born in 1922, the artist passed away at the age of 89 practicing art until his last years. Early in his career that is in 1977 he received from The President of India the Padma Shri and the Lalit Kala Ratna also by the President of India in 2007 among other awards. He was best known for devising a visual style distinct from all his contemporaries in form and content. He captured forms in nature as well as human figures by depicting the way light refracted on his subjects. Thus his brush strokes appear angular and a tad geometric. 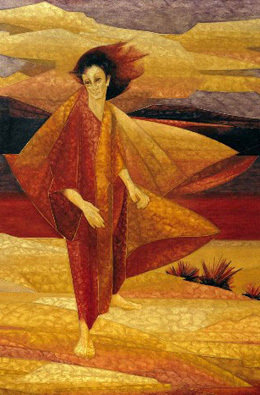 Sabavala''''s unique vision combines impressionist and cubist approaches. The lines are at once strong and sharp and yet the subtle colours and tones render a softness, stillness and tranquillity to the imagery. As this portfolio demonstrates he painted subjects such as monks and disciples, human figures in desert lands, waterfalls, mountains, trees, birds, women in saris and so on. Through the beauty and mysterious ways of nature he depicted the human psyche as seen works like Caverns Measureless to Man, In the Worlds After Light, The Predator and The Guiding Light. At Bonham''''s auction in London his "Vespers I" was sold for about Rs.2.1 crores, whereas his "Casuarina Line" was sold for about Rs.1.7 crores. Sabavala studied art at the J J School of Art, Mumbai (1942-44), at Heatherly School of Art, London (1945-47),at Academic Julian and Academie Andre Lhote, Paris (1947-51), Academie Julien (1953-54) and, Academie de la Grande Chaumiere, Paris (1957).He exhibited all over the world;among those are 30 solo exhibitions. A retrospective of his works was held in 2005-06 at the National Gallery of Modern Art in Mumbai and New Delhi. A self-taught artist, Madhvi Parekh has created a niche for herself on the Indian art scene. Her art practice reflects an amalgamation of the folk traditions and the contemporary times. She abandons academic rules to freely depict her subjects. Typically her compositions have the subject at the centre and related imagery is narrated all around in little episodes. The folk art characteristic of flat surface instead of Western style perspective is a prominent feature of her work. She uses solid colours that make her works vivid and joyous. Usually there is a black dotted line running throughout the composition as seen in the embroidered narrative folk art. Her figuration is stylisedin the vein of naïve art. Yet there is a definite intelligible way in which she constructs her compositions. Parekh narrates religious-mythical stories about gods and goddesses. Some of her pictures are of imaginary people or they are memories of her childhood. Born in 1942 in a village in Gujarat she started painting in 1964. She attributes her early art lessons to her husband and prominent artist Manu Parekh. She is a prominent artist who has exhibited on important platforms in India and overseas. She received the National Award from Lalit Kala Akademi in 1979. A film about her and husband Manu Parekh was made in 1992 with sponsorship from the Indian government. 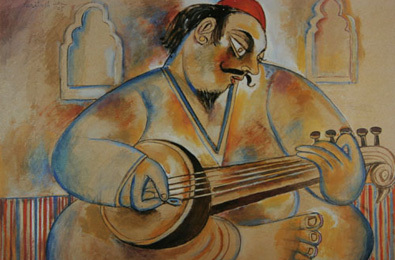 Paritosh Sen is one of India''s most important artists from Calcutta. He was a prolific painter who painted until his last days. He passed away in 2008. He was one of the founders of the first art collective in India called Calcutta Group. Sen is best known for his Modernist figurative paintings. In his compositions invariably the focus is on one person whose characteristics are portrayed exaggeratedly. The men, women and children of Calcutta were often his muse. He would caricaturize a personality from life or from literature and evoked humour and satire. His works were a commentary on society, social values and a critique of the elite social class. 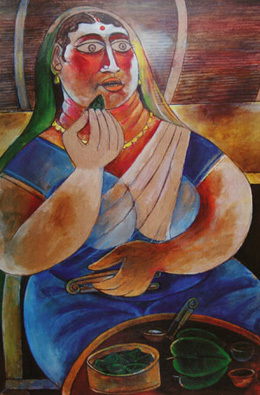 A woman enjoying the traditional process of preparing paan (betel leaf) and consuming it evokes the characteristics of housewife at leisure and the warmth of a comfortable household. The portrayal of an obese man indicates that he is from an elite background as he is shown holding a glass of coloured drink, perhaps alcohol or a cola, and a book in the other. Again this is a character that is at leisure far from the struggle of the general population. The sarod player is shown lost in his practice while the up close rendering of the portrait in "Mourning Ravana" depicts a softer side of the ten-headed demon king. While Sen commented on the social, political and economic realities of India post-independence, he chose the route of mockery over angst. 1949-54 Studied at Paris at Andre Lhote''s School, Academy Grand Chaumier, Ecole des Beaux Arts (Mural Painting) and at Ecole des Louvre (History of painting), Paris. He was also an illustrator and writer. He exhibited in India and on several platforms overseas. Rahul Gajjar is a graphic designer and photographer, based in Baroda, who has been photographing Champaner-Pavagadh, the World Heritage Site, at varying times of day and year. Gajjar has shot more than 50,000 photographs of the city over a period of 25 years. A graduate of M. S. University, Baroda, the lensman has done extensive work in digital art and has exhibited his works the world over. Gujarat?s only UNESCO certified World Heritage Site, Champaner-Pavagadh is less than an hour''s drive from Baroda, with a history that dates from 2nd century AD and dotted with Rajput-Hindu, Jain and Islamic secular and religious monuments. Spread over more than 6 sq km, it comprises the fortified sacred hill of Pavagadh with the ancient Kalikamata Temple at its summit, and at its foot, the ruins and buried remains of Champaner, the sprawling, prosperous medieval capital city built by the pre-Mughal Sultans of Gujarat. It is perhaps the most authentic medieval city in India as all the information about the original city is still available below the ground. From the highest point of Pavagadh hill one can see an undulating landscape covered with the famous forests of Champaner towards Jambughoda. The scene is interspersed with tanks, waterways, fort walls, bastions and other fragments of medieval military architecture.The sacred hill is part of the cultural landscape and eloquent local myths and legends are kept alive in the form of the Garba and Bhavai. For a number of years, Pavagadh was ruled by the Chauhans who had fortified the hill. Mehmud Begda was interested in capturing it. He succeeded after several years of siege during which he had already begun building Champaner city at the base of Pavagadh, later making it his capital. Design Temple is the creation, joy, and all-consuming passion of Divya Thakur. It is an award winning urban design think-tank that, over the last decade, has developed a contemporary Indian subverts kitsch and other stereotypes. However, rejecting kitsch doesn?t mean rejecting humour. Here we present 5 urban, contemporary, witty posters. The images reflect a vibrant sensibility with intrinsic Indian influences in a modern design language. Design Temple resonates the quest to integrate graphic design into everyday life and everyday life into graphic design. Design Temple is contemporary, affordable art that is different and can be yours for much less than you would imagine. Browse Art Intaglio?s Design Temple selections in our online gallery. 5 K''''''''s Article of faith. Sikhism defines Kesh, Kanga, Kara, Kirpan and Kachha as the 5 articles of faith. Oh young Harry Singh has come back from the West, His Kesh, Kirpan, Kaccha were put to the test. His Kangha and Kara he proudly displayed. He floats like the butterfly, like the bee he can sting. There never was a Sikh like young Harry Singh. A virtual art form due to the precision of their tying. Turbans often reveal a man''''''''s religion, position in society and state of origin. Qutab Minar India''''''''s tallest ''''''''axis'''''''' minaret. Commissioned by Qutubuddin Aibak, the first Sultan of India, the Qutab Minar stands proud at 238 feet. Besides fulfilling its role as a minaret; that of calling people to prayer, some believe it may also be a sentinel tower for defence. Ours stands tall as a symbol of victory and masculine pride. Zenana The Women''''''''s domain. A secluded area was exclusively reserved for the women of the household. This purdah-like custom still exists in some rural areas of India and gives women the space to take care of their children, do the cooking and even practice song and dance without male interference. Gobar Multi purpose cow-dung. This redolent pile of crap has, for centuries, served as a mineral enriched fuel, insect repellent and fertiliser. Some brave-hearts even swear by its cosmetic properties, which result in a glowing complexion and dazzling teeth. To encapsulate the idea of India is a mammoth task. There are several different ideas of India. Rural and urban image of the country differ. The differences in value system seen in the older and younger generations also vary. Dileep Sharma?s art attempts to capture the transition in the Indian society. The pop art colours, human figures in exaggerated poses, body art and a trendy vibe speak of modernizing of values and drastically changing ways of life in India.He references characters from Indian mythology, typical Indian rituals and beliefs, icons from the entertainment world, and the fashion milieu. Clean lines, bold colours, detailed drawing of the human figure and minutely drawn objects seem flamboyant and celebratory at one level. On another level these large scale compositions comment on the urban environment of clashing cultures and identity crisis that the youth faces. He uses the pseudonym Kunwarji, translated as prince, for himself and incorporates the word in his titles or the compositions. Ironically Sharma captures urbanity using a modified version of the ancient technique of Rajasthani miniature tradition of painting. He uses bright bold colours on stark white background which enhance the garishness of the elements he paints. The scale is usually larger than life, carefully chosen by the artist to reflect on the impact of changing norms on the lives of the young today. Dileep Sharma was born in Rajasthan in 1974. He studied Painting at the Rajasthan School of Art, Jaipur. He did MFA in Printmaking at the Sir J J School of Art, Mumbai in 1998. He has exhibited widely in India and on international platforms. Several awards and honours have been conferred upon him. Few capture satire and humour in joyous colours as senior artist Amit Ambalal does. His paintings depict human behaviour and idiosyncrasies of life. His work regularly features characters in the forms of lions, elephants, crows, cows, lotuses alongside human figures. He finds inspiration in folk tale traditions. In his work the narrative is not as decisive as is the significance of his characters portrayed in exaggerated bodily poses and contorted facial expressions. The stylised forms are revealing. He could be mocking at something he has witnessed or sharing the innocence found in a tale or even retelling religious myths or folk stories. He could be mix-matching various ideas and images into his tight compositions. The essence that one draws from his work is a lot of exuberance reflecting the flow of life. Ambalal is also known for his passion for Nathdwara painting tradition which has been of particular interest to him and has been a source of inspiration. A former business man, Ambalal took to painting fulltime in 1979 at the age of 36. He is a self-taught artist who sold his family business to pursue his passion for artistic creation. 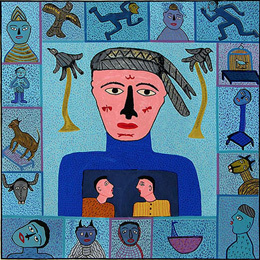 Born in 1943, the artist lives and works in Ahmedabad. He has exhibited on several prestigious platforms in India and overseas.